A simple t-shirt that fits well and feels comfy can be difficult for some men to find. There is so much choice that finding the perfect tee is often a little easier said than done. Fit, quality, and feel of the material are all critical factors to consider in your search. 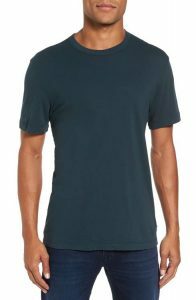 We have compiled a list of some of the best options if you are on the hunt for the most comfortable t-shirt ever. Our list includes a range of options for all budgets; we found some very popular designs that only cost a few dollars, as well as a few of the most loved designer’s styles that will work all kinds of body types. 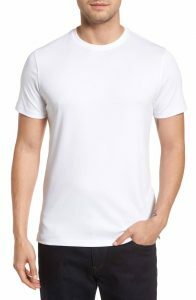 Whether you are looking for an undershirt or an essential tee for the summer, we have found some of the best men’s t-shirts that you will love to wear. Next Level is one of the most popular budget styles that often surprise people with how nice they are for the price. They are incredibly soft and comfortable and fit most men very well. Next Level has a few different styles and fabric blends to choose from, but for comfort one of their best options is the CVC Crew. This style is 60% Combed Ring-Spun Cotton and 40% Polyester. The CVC Crew works well for men with who are tall and who have long torsos, or for those who just like a longer shirt. The fit is relatively close to the body, but not restrictive like a tight shirt can be. Next Level has a vast color selection, there are somewhere over 35 colors available, and by most reports, the shirts hold their color well without fading over time. It would be tough to get a better basic t-shirt for the price. For a daily, casual wear shirt that will keep your comfy, the Next Level CVC Crew is worth a look. 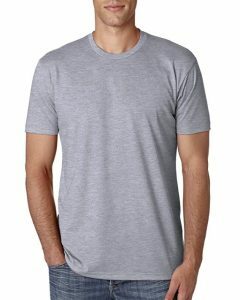 Another brand of t-shirts that are good quality but you probably want to catch them on sale is the Banana Republic tees. They have three designs that seem to be battling it out to see which style comes out on top in terms of comfort. The Banana Republic Authentic SUPIMA® Cotton Tees, Soft-Wash Crew, and Luxury-Touch Crew are all worth looking at if your primary goal is comfort. The Supima style would be a great all-rounder shirt as it is soft, thick, and drapes nicely. While the Soft-Wash will be super comfy, but it is quite thin so it may not last as long as other styles. The Luxury Touch is designed as a dressier version of a basic tee. Another great, budget option that is easy to find on Amazon are Canvas brand shirts. Canvas has a few different styles, but one of the best for comfort is the Unisex Triblend. Like the Next Level shirt, it is cheap, decent quality and has a more fitted cut than a Hanes or Fruit of the Loom design. This is another great style for men who are tall and who are looking for a slim fit. Often if you are tall, it is hard to get a shirt that is long enough without it being too loose in the fit. The material is a tri-blend, which means that it is 50% polyester, 25% cotton, 25% rayon. So it is pretty soft and a little bit thin, but super comfy. One issue that is common when you get a smooth, lightweight material that feels amazing, is that it tends not to last as long as the thicker, more heavy duty tees. A couple of things I wanted to mention about Canvas shirts is that the lighter colored styles are relatively thin and don’t hide those areas (love handles, etc.) that you may want to keep hidden. The darker colors don’t have this issue. The other thing is that the colors have a little bit of heather like appearance, so it isn’t an entirely solid color. Overall very nice shirts though. Considered by some to be one of the best brands of t-shirts around, J Crew is well loved for their great fitting, comfortable t-shirts. 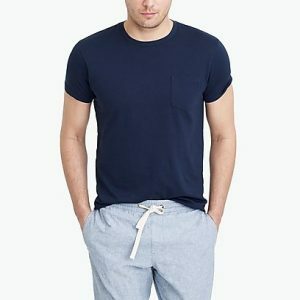 While most J Crew t-shirt styles fit well on a variety of body types, they are especially useful for those who are thin and athletic since they are kind of a close fit and the sleeves are fitted to the biceps. 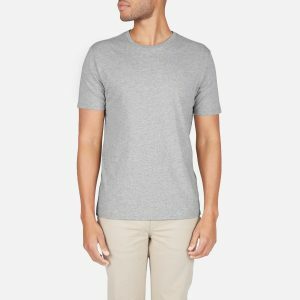 J Crew has a bunch of different designs including a new tri-blend, but one of their most loved styles is the broken in cotton jersey. 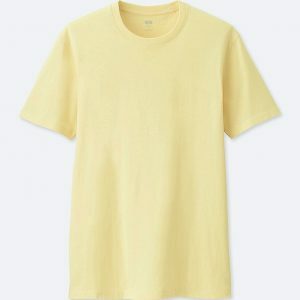 The regular cost for J Crew tee is around $25 to $35 a shirt, but you can often get these shirts on sale for about $15 or check out J Crew Factory. Everlane makes a lot of very comfortable, quality essentials including this Cotton Crew. It is a tee that is well tailored, so it doesn’t feel too loose or too tight on most body types. Since it is 100% cotton, it will soften up the more you wash and wear it, although it is plenty soft when you first get it. The cotton is pretty high quality, comes in a nice selection of colors and it will hold its color well after repeated washing and wear. Many men consider the Everlane Cotton Crew to be the perfect shirt, partly because they are a good weight for everyday wear, not too thin, not too thick. They also drape well, without feeling boxy or tight. They cost around $18, so they aren’t overly expensive so that you can stock up on a few different colors for the summer. For those who prefer more of a designer style of t-shirt, Robert Barakett is an excellent brand to check out. They are a bit pricey but not quite as expensive as Sunspel or A.P.C. Fans of this shirt love the quality and the softness of the Pima cotton with a soft wash finish, meaning it’ll be softer and more durable than more budget options. This is a shirt that can go casual or dressy, but it leans a little more on the formal side. 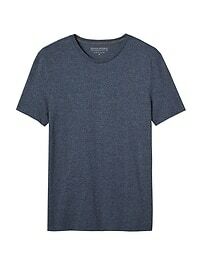 A designer t-shirt that is renowned for its comfort is the James Perse Crewneck Jersey T-Shirt. These shirts are made in the USA from a 100% combed jersey cotton. Jersey cotton is a single knit fabric that is known for being very soft, a bit elastic and for draping well. The James Perse Crewneck comes in a great selection of colors, and most men seem to love the fit of the design. The fabric is a good medium weight, so it is thick enough not to be see-through like many jersey T-Shirts. The material and the design of the shirt means that you can wear this style as either dressy or casual since it has a reasonably luxurious look and feel to it. A more budget-friendly option is the Uniqlo Men Supima® Cotton Crewneck. These are excellent value for a decently low price. Since they are Pima cotton, they are very soft but are that good quality cotton that feels slightly better than regular cotton. You can wear this style as either an undershirt or a regular shirt as it comes in a nice variety of colors including the primary colors. This shirt has a little looser fit than most of the other options on this list. The length is relatively long, and the sleeves are also on the long side compared to other brands. Another favorite budget option is Old Navy t-shirts. Overall Old Navy tees are known for being very soft, having a modern fit to them and of being inexpensive. They are also durable and come in a vast selection of colors. Old Navy making them perfect for everyday wear. They wash well, fit true to size and are a decent thickness of material (not overly thick, but not too thin). For the price, you can buy a whole range of colors. I wanted to put at least one modal shirt on this list since the fabric is so comfy and people love modal so much. 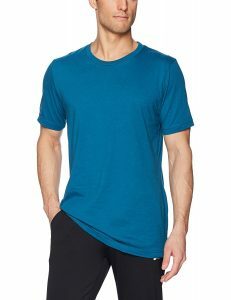 The shirt that seemed to be one of the best options for everyday wear was the Calvin Klein Men’s Body Modal Short-Sleeve Crew-Neck T-Shirt. If you aren’t familiar with modal, it is a silky, very smooth material which makes it a great option as an undershirt or a super comfy shirt that you wear around your house. 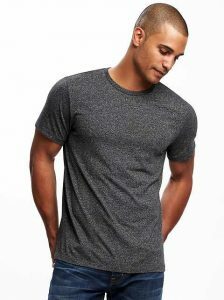 Some men wear them as regular t-shirts, but just the darker colors as the white would be too thin and not look right as a regular out and about t-shirt. The CK Modal Crew-Neck is a slim fit, so it hugs the body, but since the fabric is so soft and breathable and it can stretch, it isn’t constricting like a more heavy duty cotton polyester blend. This style isn’t cheap; they run around $30 a shirt, so they aren’t for everyone. Unfortunately, the CK Modal Crew-Neck doesn’t come in much of a range of colors just three; mink, black and white. A couple of other things to mention about modal is that it is somehow able to keep you warm in cold weather and cool in hot weather. It also isn’t the most durable, since modal is very soft and pretty thin you have to be somewhat careful washing and drying them. They are a little more high maintenance than a regular cotton-poly blend, but the feel of the shirt in terms of comfort can’t be beaten. Sizing- Unfortunately, since sizing differs across the different brands you may need to try out a few sizes before you get a great fit. One of the most significant problems that men run into is the length of the shirt, especially if you fall outside average sizing. If you are short and a little husky there is a good chance you will find a lot of styles too long especially if you have to go up in size for the fit. If you are very tall, you may run into issues with the shirts being too short, but if you go to extra large, the overall fit becomes too tent-like. Many brands have fit and sizing guides on their sites that you should check out. Fabric-T-shirts are made from a lot of different types of fabrics. If you are looking for an everyday t-shirt not an athletic kind of material, cotton is a good option. For those on a tight budget, you may want to look for cotton and polyester blends that may include a bit of Rayon for softness. Some designer options are made of silk and modal blends, that are super soft, but you will pay quite a bit for those styles. Supima cotton (high-quality cotton mostly grow in the US, and modal and Micro modal fabrics have been getting more and more popular in the last few years. You can also get Pima Cotton shirts from UNIQLO or Banana Republic that are very soft (they are like Supima but are not verified by Supima Association to meet the strict requirements to be called Supima. Supima cotton is Pima cotton that is made in the USA). Fit– Fit is the toughest thing to get right when you are shopping for that perfect t-shirt. Since there is such a range of body types and heights you can’t really say that there is one ideal shirt that will work for everyone. The trend these days is towards a fitted, more tapered t-shirt. If you like a looser fit, you could try the Uniqlo styles or American Giant. You could also stick with traditional t-shirt brands like Hanes or Fruit of the Loom that often also have a looser fit. Price– These days you can spend almost anything on a t-shirt, from a few dollars to well over a thousand if you are going high-end designer. A lot of men love the cost, fit and quality of Next Level and Canvas shirts that you can get for only a few dollars. But if you are looking for the latest fabrics or special features like antibacterial, moisture wicking or silk or modal type blends, you will have to pay more for that. Durability– When shopping for comfort you have to walk a bit of a fine line between getting a garment that will last for years and one that feels amazing. Often the best feeling shirts are those with the thinnest, softest material that usually isn’t the most durable. Most of the shirts that we choose for this list have material that feels great, washes well, and will last. Made in the USA T-shirts– For those who prefer to buy made in the USA or Canada shirts you should check out James Perse, American Giant, Buck Mason, some styles of Canvas shirts and Reigning Champ (produced in Canada). 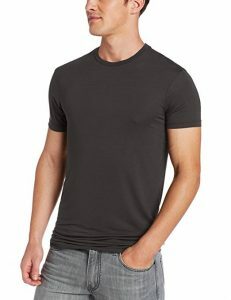 Neck– Most traditional t-shirt necks are either a crew (round) neck or a v-neck. In the last few years scoop collars (wider more oval cut around the neck) are increasing in popularity. You can get deeper cuts in either the crew neck, v necks or scoop neck although we didn’t explore these style in this post. Excellent article! The best I have found on this subject. Proobably 30 years ago I purchased a t-shirt brand name Cherokee , I have probably purchased 50 shirts since trying to find this level o breezy comfort. At the time the tag said 95%nylon and 5% spandex. I still have the shirt shirt , it still looks excellent, it can be worn as a dressy appearance under a sport coat, but I am afraid to wear it out. I have lost the content tag because I carried it in billfold with hope of finding one or more again. The shirt is breezy, but black and not see thru. Can anyone help? I would kill to get one again.